It’s no secret that paid advertising is becoming an essential part of your business’s social media campaigns. You may have already dabbled in paid advertising and no doubt have come to realise that composing the perfect Facebook ad can take time and practice. Every Facebook ad is different and every audience has different needs — but if you want to start improving your conversion rates and begin lowering your cost-per-clicks then read on for our expert tips. Your first port of call needs to be the creation of marketing personas to target the needs of your customers. Remember, relevance is the key to success, and the audience you choose will affect how much you pay. There are a tonne of audience options available, right from demographics (such as parents with adult children) to behaviours (people who connect to Facebook through an android device); and then, of course, you can target your adverts based on interests. Your tone, branding and images need to match the message on your adverts landing page. If you are promoting blue widgets and your Facebook advert says you have 30% off blue widgets, then that is what people will be expecting from your landing page. All too often great adverts are let down by not choosing the most relevant landing page on your website. A study from HubSpot found that content with relevant images can receive 94% more views than content without relevant images. When it comes to choosing your perfect image, use professional stock images or use a tool like Canva to create a branded illustration. Not only will good quality images help your advert look professional, but they will also help to improve your Relevance Score. No good advert is complete without a clear call to action. Having a well-designed advert with a strong call to action will not only help to increase conversions, but it will make your advert stand out from the crowd and get a better click-through rate. Studies have shown that the inclusion of a call to action button dramatically improves click-through rates by up to 3 times the average. To get maximum impact for your advertising you should be scheduling your adverts to appeal to your audience. Looking to get more customers into your restaurant? Well, advert scheduling is the key. Try to plan for your adverts to appear at key times such as lunchtime and early evening when Facebook activity is high. As with any form of paid advertising, data is your friend. Learning from insights will help you to look back at campaigns to see what worked for you, and perhaps more importantly, what didn’t. From working out which age groups respond the best to your adverts to looking at which placements work for your products, insights is a powerful tool that can help you get the most from your marketing budget. One of the old adages of paid marketing rings true for Facebook, and that is Always Be Testing. Take the information gleaned from above and apply it to different ads. Other elements you can test include interest, location, age, URL content, post content… the list is endless. 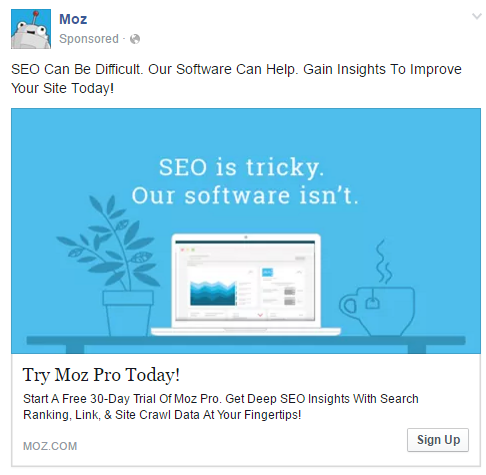 Luckily one of Facebook Advertising’s neat features is that you can easily duplicate ads and make slight tweaks. It may seem like a long process and take time and effort, but, when your cost-per-click prices come down and your conversion rates increase, it will be worth it.